Inspired by Aston Martin’s famous 1-2 finish in the 1959 24 Hours of Le Mans with its iconic DBR1, Aston Martin Cambridge has devised a collection of 24 very special DBS Superleggeras – one for every hour of the legendary endurance race. Called the ‘DBS 59’, each car is defined by custom designed features, hand-crafted interiors and graphic elements which draw inspiration from the DBR1 and the race it so infamously surmounted. Aston martin is identified by its success in the world’s toughest endurance race – the last being a breath-taking class victory for the V8 Vantage GTE in last year’s race – Aston Martin’s unequivocal win in the 1959 24 Hours of Le Mans is the stuff of motorsport dreams. Coming up against stiff opposition from works Ferrari and Porsche entries, plus a team of Ecurie Ecosse Jaguars, the David Brown Racing Aston Martin DBR1s fought bravely to score a famous 1-2 finish in a strong display of speed, reliability and teamwork. Since described by Sir Stirling Moss – who helped Aston Martin win the 1959 World Sportscar Championship – as ‘the most important Aston Martin ever produced’, the DBR1 has attained iconic status, and well deserved too. Only five were built between 1956 and 1959, making it one of the rarest Aston Martins ever. So iconic and sought after, the one last went to auction (at Monterey in 2017) set a new world record as the most valuable British-made car ever with a sale price of £17.5m ($22.5m). Identifiable immediately by its exquisite and timeless Aston Martin Racing Green paintwork, the DBS 59 showcases extensive use of gloss finish Carbon Fibre, most noticeable on the roof, roof strake and painted bonnet louvres. A clever combination of Obsidian Black and Chestnut Tan leather has been applied throughout the interior, along with fabric which was inspired by the DBR1 seat material used to trim the ‘DBS 59’s’ seat backs and door inserts. Bronze detailing is applied around the exterior and interior, with the front grille surround, ‘Superleggera’ bonnet script, rear Aston Martin script and Q Fender Badge amongst the items painted. 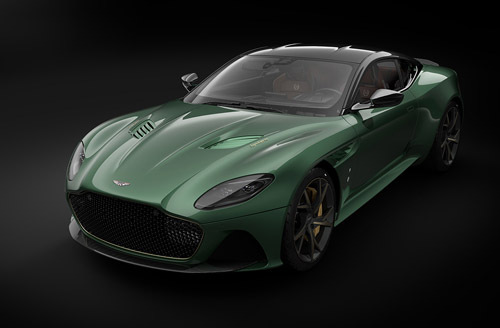 You’ll also spot Q by Aston Martin detailing like Saddle Leather Helmet Pods in the rear compartment to hold special ‘DBS 59’ crash helmets, race suits and gloves, and a bespoke ‘DBS 59’ logo embroidered in the seat headrests. Each of the ‘DBS 59s’ will be identifiable by a small painted white roundel adjacent to the side strakes, with each car numbered from 1-24. Additional accessories to whet your appetite include period blue race overalls complete with Aston Martin and ‘DBS 59’ logos; replica string-backed racing gloves modelled on those worn by 1959 Le Mans-winning driver Caroll Shelby; replica 1959 race helmet; bespoke 2-piece luggage set to match interior trim; bespoke car cover in Aston Martin Racing Green and featuring white roundels with specific edition number. The DBR1’s proud genetic heritage is very much on show in the 2018 DBS Superleggera. The fastest and most powerful series production model in Aston Martin’s multi-award winning range, this 211mph, 715bhp Super GT has an inspirational combination of imperious performance and impeccable style throughout. Having received the attention of Q by Aston Martin: Commission it is a truly car worth coveting; one pitched to those who appreciate the lasting significance of DBR1’s historic victory and world-beating contemporary performance and handling of the DBS Superleggera. Talking about the‘DBS 59’, Aston Martin Vice-President and Chief Marketing Officer, Simon Sproule said: “When Aston Martin Cambridge expressed a desire to create a limited run of DBS Superleggeras inspired by the DBR1’s famous Le Mans victory we knew it had to be something special. The soft metallic hue of the Aston Martin Racing Green paintwork is classy and timelessly beautiful; the level of thought and detailing is exceptional. My favourite element on the ‘DBS 59’ are the seat backs that feature fabric inspired by the DBR1 seat material, but there are countless touches that will intrigue and delight”. Following on from the success of last year’s Red Arrows Edition Vanquish S, and the earlier success of V12 Vantage S Spitfire 80 Edition, marking 80 years of the Supermarine Spitfire’s first flight, and the Vantage S Blades Edition, developed in collaboration with the Blades Aerobatic Display Team, the ‘DBS 59’ limited edition is the fourth Q by Aston Martin: Commission from Aston Martin Cambridge.